Fennel is both a vegetable and a spice. As a spice, the dried seeds are ground for use. Fennel smells somewhat like star anise, Anise and liquorice. Fennel can be used in pizza sauce. 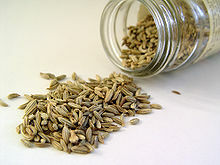 The small seeds, similar in size and appearance to cumin seeds, are used in Indian cooking (eg as an ingredient in garam masala) or a constituent of pan masala, where their digestive properties are exploited. The leaves are finely divided and feathery, like dill. The herb is frequently used with fish. Florence fennel, a cultivar of the plant, is grown for its bulb, which is used as a vegetable. As a vegetable, the stalks are used. A typical use would be stir-fry. This page was last edited on 8 August 2013, at 04:26.